"To me a photograph is a page from life, and that being the case, it must be real." Weegee was a legendary news photographer, whose stock and trade were candid shots of people in the streets, in bars, and at crime scenes. His professional name was Weegee (spelled phonetically), after the popular fortune-telling game, Ouija board, to which his supposed sixth sense for crime was compared. This "sense" led him to the scene well ahead of the police - although it turns out that he actually had his radio tuned to the police frequency. 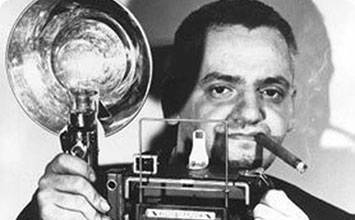 Thus, Weegee created his own legend and reveled in his own notoriety. Yet, more importantly, his voyeuristic photographs exhibited the underbelly of New York City, melding popular culture with the experience of immigrants and the working classes, catching the attention of both the news media and the fine art community. Weegee's Photojournalism focused on the picture's narrative content and visual punch, making his human interest stories novel. They drew attention to the extremes and foibles of the city crowd, who constitute an unknown underworld. As historian Graham Clarke points out, Weegee thus "images a secret city: murder victims, muggers, transvestites,... [as well as private moments] - anything that might feed his hungry eye in search of the sensational and murky photograph." Weegee worked at the PM Daily paper which established a new model of reportage that Weegee took full advantage of to introduce new subjects as well as expand his own repertoire of images to include crime scenes, street people, and circus performers. His photographs had their own meaning, and served as a source for various kinds of photo-essays, which ultimately appear in his photo book Naked City. Like the progressive press he worked for, Weegee was caught up in the field's newness, sense of possibility, and influence. He therefore organized his last chapter in Naked City as a long essay on what he called "Camera Tips." He told aspiring photographers, "Don't try to guess focus, just practice six and ten feet." He advised amateur photographers, tempted by the fancy new flashes, against using them and told them "I still use a flash bulb." The press flash-gun, Weegee's preferred mode of illumination, literally exposed his subjects in a sensational manner. 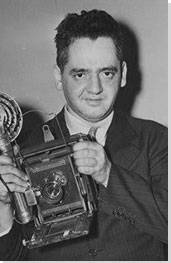 Weegee was born Usher Fellig on June 12, 1899 near the city of Lemberg, Austria, what is today Zolochiv, Ukraine. Yet, his story begins once he immigrated with his family to the United States in 1909 at age 11. Upon arriving at Ellis Island, his name was immediately changed to the more American sounding Arthur. Like most immigrants, Arthur grew up in extreme poverty, and spent his childhood living in a Lower East Side tenement building in New York City, along with his parents and three other siblings. His father, Bernard Fellig, sold goods from a pushcart around the neighborhood for a meager wage. Bernard became an ordained orthodox rabbi and kept the Sabbath, even though it hindered him from earning money for his family. This image captures firefighters attempting to battle a fire engulfing the American Kitchen Products building that bears a Hygrade Frankfurters billboard. The sign across the center of the building that reads: "Simply Add Boiling Water," lends this image its title. It describes in a tongue-in-cheek manner the firefighters act of dousing the building, ironically located on Water Street, with water. Weegee's ability to seize on the irony in even the most horrific of images became his stock and trade, and improved his chances of selling the photo to a newspaper. In the July 1937 issue of Minicam Photography, this image was used in a how-to article with the caption: "The sign across the center of the building refers to the frankfurters, not the firemen!" - referencing Weegee's unrivaled ability to infuse an image with dark humor. Like film noir movies, a cinematic genre begun in the 1940s, Weegee's photographs are a darkly stylized version of reality. His distinctive images inspired film noir because of "[their] lack of naturalness. ...[the very] source of their melodramatic power," according to the art historian John Szarkowski; "It is as though terrible and exemplary secrets were revealed for an instant by lightning," namely Weegee's flash. Previously known as melodramas, black and white, moody film noir movies used murder as a typical plot device and were characterized by their fatalistic and menacing nature. Simply Add Boiling Water could easily pass as a still from one of these films. In Body of girl hit by car on Park Avenue, New York, is a simple, but moving image about the outcome of a typical, yet gruesome car accident. Weegee creates a powerful work by focusing on the dead body lying in the street covered by a white sheet. The starkness of the white sheet against the darkness of the night created what Weegee called his "Rembrandt light," in which he catches the covered body in the white glare of his flash while the rest of the scene is enveloped in darkness. A police officer, unable to do anything else, walks away from the scene and towards his car in the distance. Weegee carefully surveyed the scene, searching for the best angle to shoot in order to create the most stylized image and to capture the telling detail of a black purse next to the body. The purse is the only clue that indicates the victim is a female. For the first decade of his career, Weegee worked after hours, spending every night traveling the streets of New York capturing one gruesome scene after the next. As art historian, Mark Svetov explains, "Weegee's news pictures were never haphazard snapshots, albeit they were taken by a man who had happenstance and chance as his helpmates... [his] pictures seem perfectly arranged, and what we focus on is their human content." His ability to select the most telling and significant moment of an event made his work respected by both the fine art community and the public. A feat which is still unusual today. In Balcony Seats at a Murder, Weegee captures police investigating a man who has just been killed outside his shop, while onlookers gawk at the scene from the tenement's fire escape. Weegee explains the image in his own words: "I arrive, right in the heart of Little Italy, 10 Prince Street, here's a guy who had been bumped off in the doorway of a little candy store. This was a nice balmy hot summer's night, the detectives are all over, but all the five stories of the tenement, people are on the fire escape. They're looking, they're having a good time, some of the kids are even reading the funny papers and the comics. [...] I step all the way back about a hundred feet, I use flash powder and got this whole scene. The people on the fire escapes, the body, everything... To me this was drama, this was like a backdrop." Weegee understood the social phenomenon that surrounded a murder; it was as much a spectacle for rubberneckers at the crime scene as it was for those paying to read about it in the newspaper. By including the action surrounding the victim, Weegee set himself apart from other photojournalists, who instead focused their lens solely on the victim. Weegee's interest in the whole scene enables him to create a narrative that focused on the surroundings and on the aftermath of the murder. Because of his ability to express the unfolding drama in one image, Weegee's photos became the perfect visual accoutrement for tabloid news. Weegee could very well proclaim himself the "Official Photographer of Murder Inc.,"having photographed over 5,000 murders during his decade-long career as a crime photographer. Weegee captures the startled crowd's varied reactions to seeing the murder of a gambler in broad daylight. The children witnessed the shooting of Peter Mancuso, as he waited in his car at a stoplight. An unknown gunman opened fire, just as children were let out from P.S. 143 in Williamsburg, Brooklyn. The children and other bystanders express an array of human emotion and self-absorption in response to this grisly scene: from laughing, crying, staring in disbelief to looking at the camera. The light of Weegee's flash bounces off their skin, representing the city's outline in silhouette in the background. What makes this picture remarkable is the fact the dead body lay at Weegee's feet as he took the photo. For the first time, Weegee represents the bystander as the main subject of his picture. The photograph was published in Naked City and its caption, written by Weegee, reads: "A woman relative cried...but neighborhood dead-end kids enjoyed the show when a small-time racketeer was shot and killed." On facing pages, Weegee presented his bystanders and showed the gambler's bloody body lying in the street. I Cried When I Took This Picture depicts the central drama of a devastating fire, the shrieks of Ms. Henrietta Torres and her daughter Ada, as Ada holds onto her mother in a distraught embrace. The agony and despair is written on their grief-stricken faces as they watch helplessly while family members are trapped in the burning tenement building in Brooklyn. The pair's starkly illuminated faces are framed in darkness, adding more drama to the picture. When Weegee published this image in his seminal photo book, Naked City, he used this particular image, the art historian Anthony Lee concluded, "as an occasion for maudlin self-reflection." The photograph had lost its connection to the original incident, its specific place and time, allowing Weegee to transform the image into a story about Johnny, the son of Ramona Malave's aunt Henrietta (who had no sons). He juxtaposed the photograph with other pictures taken years apart and included a laconic caption to describe the horrific scene: "Mother and daughter cry and look up hopelessly as another daughter and her young baby are burning to death in the top floor of the tenement. ...firemen couldn't reach them in time ...on account of the stairway collapsing." Although he hardened himself against the gruesome scenes he photographed, Weegee was not immune to his subject's misfortunes. He always kept his focus on the people rather than the event. Unlike his newspaper editors, he understood that by including an image of the people whose lives were destroyed by the fire, he was forging an emotional connection between the viewer and the characters he photographed, thereby making the event more personal for the readers and producing a more powerful story. Weegee commented, "Of course, I ran into snags with the dopey news editors. If it was a fire they'd say 'Where's the burning building?'. And I say 'look, they all look alike. Here's the people effected by the burning building.'" Weegee insisted on having this image published, as he said, "[to try to] humanize the news story." Before this image appeared in Naked City, it was printed several times and each time with a different meaning. It appeared first in 1940, without a title, in a PM Daily article on the differences between picturing "real" and contrived emotions. In this context, the picture became an example of extreme emotional distress. Tenement Sleeping During Heat Spell, Lower East Side, New York, depicts a group of children as they sleep curled together on a fire escape, during a New York heat wave. Shot from above and at night, the image shows the tight, rectangular space of the fire escape seen over a metal bar and a clothesline, which accentuate further the children's boxed-in sleeping quarters. Recalling that night, Weegee writes, "in summer I always keep an eye out for hot weather pictures. I got this one on the East Side - looking down on the fire escape. There were more children, but I couldn't get them all in. I used to sleep like this in summers myself when I was a kid." Reminded of his own impoverished upbringing, Weegee had a particular tenderness towards the children and often focused his camera on the poor and the exploited. Had Weegee not worked for the newly created progressive tabloid newspaper, PM, this image may never have existed. Understanding the precariousness and significance of this image's existence, Weegee once remarked, "when people look at these pictures of people sleeping on the fire escapes, and kids and little girls holding cats, they just won't believe a thing like that has happened." PM gave Weegee the artistic freedom to create a varied body of work, while other papers only wanted images of morbid crime scenes. The newspaper was truly radical in its nonconformity, and featured a mission statement that read: "PM is against people who push other people around. PM accepts no advertising. PM belongs to no political party. PM is absolutely free and uncensored. PM's sole source of income is its readers - to whom it alone is responsible. PM is one newspaper that can and dares to tell the truth." For Weegee, working for the paper was essential to his progress as an artist. Here Weegee captures the pure, emotional joy of children as they play in the street, delighted by the spray of water coming from a fire hydrant on a hot summer's day. The spontaneity of the moment is communicated in the expressions on the children's faces. As the great photographic documenter of New York, Alfred Stieglitz explains, "it is up to the photographer to capture [the fleeting second] on film because like the dying day, the things will never come back again." Weegee had an innate ability to capture a perfectly, timed moment, whether he was shooting people during their darkest hour or children playing in the street. Although Weegee mostly shot at night, he was partial to capturing passing moments of happiness during the day. Weegee understood the importance of catching these carefree and ephemeral moments during a time when Americans had little to be happy about. Still struggling with economic uncertainty, the country found itself fighting in the second World War. There was much to worry about, but this image, offering its light-hearted slice of New York life, became a reminder that there were still reasons to rejoice in the everyday. The Critic, also known as The Fashionable People, focuses on two wealthy women, Ms. Margaret Kavanaugh and Lady Decies who regularly graced the society columns, as they walk towards Weegee's camera. They are completely unperturbed by the disheveled woman who emerges unsteadily from the dark to confront them. The women's white finery provides a stark contrast to the drunken woman's dark, worn, and soiled clothing, while their utter indifference towards her completes the portrait of disparity between the social classes. Believing Weegee had captured the moment spontaneously; the image was immediately published by Life magazine, much to the humiliation of the two socialite women. However, it soon came to light that Weegee, ever the showman, had planned and staged the encounter. The disheveled, drunken woman was a regular at a bar Weegee frequented and after buying her ample booze; he brought her to the Opera's opening festivities just as guests were arriving. He patiently waited for the two wealthy patrons and released the intoxicated woman when they walked by. Weegee was asked to shoot the high society members as they made their way into the Diamond Jubilee celebration at the Metropolitan Opera in New York City. His images often poked fun at the wealthy with humor rather than malice, which makes the staging in this image irrelevant. Robert Capa, who was also a photojournalist rumored to have staged his most famous work, Falling Soldier, explains this phenomenon best when he states, "the prize picture is born in the imagination of the editors and the public who sees them." As a result of its simple yet profound social commentary, The Critic, is considered by many art historians to be Weegee's most important work. Time magazine declared it one of the "100 Most Influential Images of All Time." In Marilyn Monroe Distortion, Weegee uses a kaleidoscope lens to manipulate a portrait he took of Marilyn Monroe. The distortion scrunches her facial features, making her puckering lips appear smaller, elongating her closed eyes, and turning her nose into a pig's snout. The iconic beauty is transformed into a caricature. "Weegee's transmogrified sequence of Marilyn Monroe head shots, assembled by multiple exposures, melted negatives, lens trickery," according to the art historian Mark Svetov, "both anticipates and transcends the Pop movement that took the art [and] design world by storm in the 1960s." During the last 20 years of his life, Weegee ceased working as a photojournalist and began focusing on what he considered more artistic and creative work. He experimented with distorting images of celebrity faces, remarking that he "had to have a lens out of this world to do full justice to the strange sights and people which is Hollywood." Inspired by his time in Los Angeles, much of Weegee's distorted work was dismissed as kitsch and ignored by the art world, which preferred to celebrate his earlier, macabre work as art. One person who admired the work was Monroe herself, who became one of Weegee's good friends when he lived in Los Angeles. Pop artist Andy Warhol not only admired his distorted images, but even appropriated them into his own work. Today these images are recognized as important precursors to Pop art.